Now this is just a fun pop-punk rock & roll album. 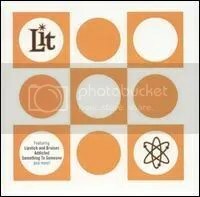 Lit hit it big with “Miserable” and “My Own Worst Enemy” on their 1999 album A Place in the Sun, but as much as I loved “Miserable” I couldn’t be swayed to pick up the album. Well, the lead single here was “Lipstick & Bruises” and I simply had to get this album when it came out. I hadn’t listened to it in years and it actually takes me back to a weird time in my life when I was virtually living on my own, but I loved the album and upon listening to it again, I still love it. Lit’s pop-punk style got them thrown in with a lot similar bands from the same era such as Blink-182, Sum 41, SR-71 (What WAS up with all those numbered bands anyway? ), Good Charlotte and Eve 6, but the difference is Lit had more of a hard rock edge than any of those other bands. Good disc to spin when you’re in the mood for something light and fun. “Over My Head” features Steven Tyler on backing vocals and was originally from the Titan A.E. soundtrack. I don’t think it was originally written for this album and was only added on because of its success from the soundtrack. The initial pressing was a “Limited Edition” that featured a second CD with three tracks. One from Lit and the other two from bands signed to their Dirty Martini label.